Roll up, roll up, Hearthstone’s expanded once again. 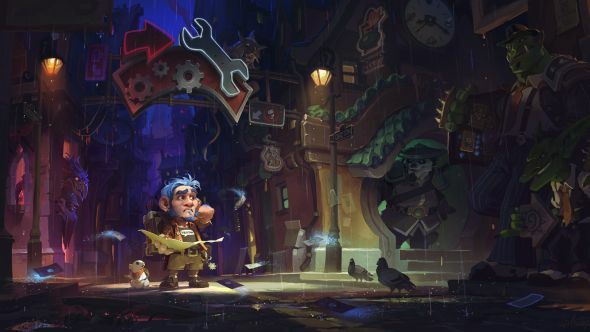 Mean Streets of Gadgetzan is now available on the US server, and should be rolled out across the world over the next couple of days. The pre-purchase deal has now ended too, but you can buy packs for gold. For a full list of Gadgetzan cards, we’ve got you covered. As usual, Twitch’s servers are taking a pounding as the people flood to watch streamers unload their packs. Here’s Kripp up to 82,000 viewers, quite a way from his 120k peak during Whispers of the Old Gods. The game as a whole is getting up towards 200,000 and will likely break it as more people realise the cards are out. Expect a busy time over the next week of figuring out the best decks, complaining they’re overpowered, realising there are better decks, complaining the set was pointless, and then everyone settling into a more normal routine. EU is confirmed for tomorrow, probably in the morning, if you’re wondering. At least the server load should be down by then.